Donald Trump held two rallies in Michigan on Monday hoping to pull an upset in a state that hasn't backed a Republican president since 1988. Trump showed up to his rally at the DeltaPlex in Grand Rapids an hour and a half late, but he didn't waste any time getting down to the issues. "It used to be that cars were made in Flint and you couldn't drink water in Mexico. 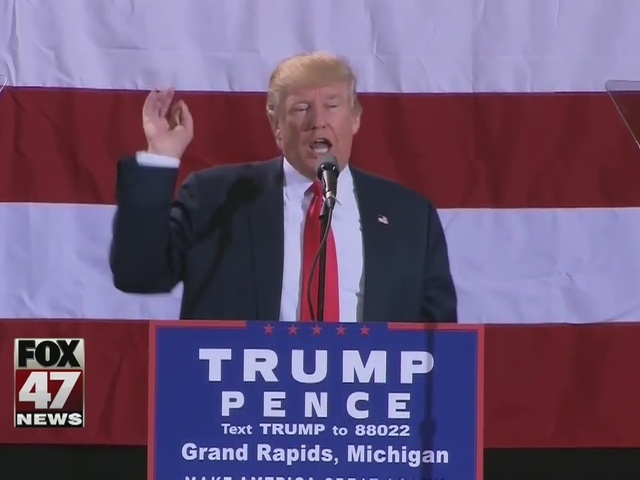 Now the cars are made in Mexico and you can't drink the water in Flint," Trump told the crowd of thousands. Trump focused much of his speech on bringing back jobs to the state and singled out auto companies for laying off workers. "We do all this trade we have a trade deficit of $800 billion," Trump said. "We are living through the greatest jobs theft in the history of the world and the people of Michigan perhaps more than any other place." Trump didn't shy away from Hillary Clinton, saying the FBI's latest email investigation will take Clinton down. "We can be sure that what's in those emails is absolutely devastating," Trump told the crowd. "Hillary wants to blame everyone else for her mounting legal troubles but she had brought all of this on herself." Trump told supporters there will be a "constitutional crisis" if Clinton wins the election, because he's predicting she will face a criminal investigation over her emails and says because of that she will get done in office. "I don't think they're going to find a thing else, it's like looking through trash," said Marshall Kilgore, who rallied for Clinton outside the DeltaPlex. 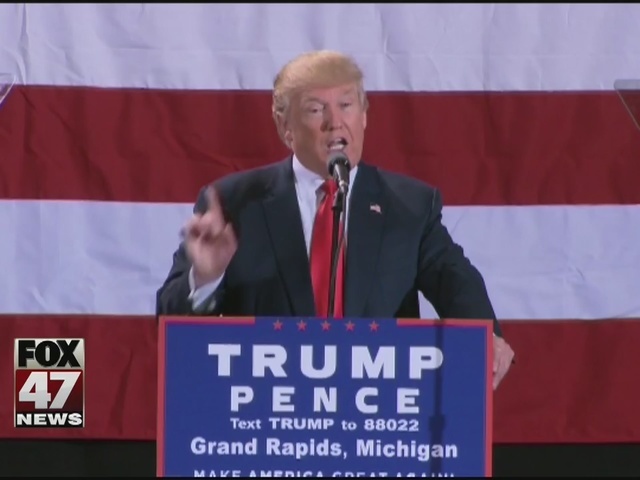 Kilgore said Michigan can't afford a Trump presidency, especially after he says Trump alienated many voters. 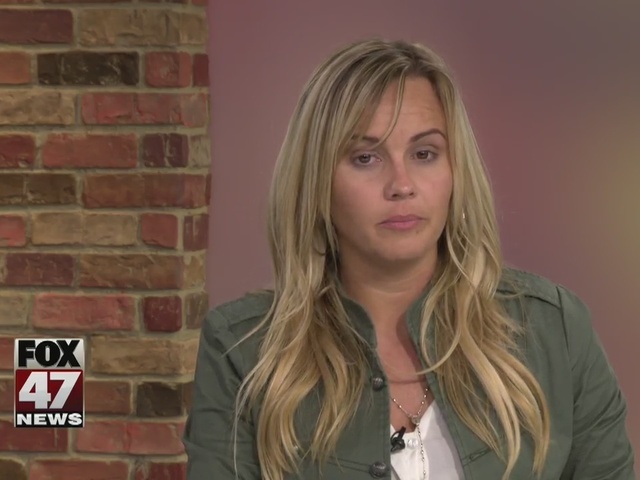 "The nonjudgment factor that she has is why I support her the most, Kilgore said. "She's been an advocate for women and families for decades." Trump supporters like Vikci Smyth Douglas say it's the other way around. "Trump is running against Hillary, the DNC, the media, the corruption, the lies. It's like he's running against them and you know what he's doing a darn good job," Smyth Douglas said. She's hoping Trump's latest visit will turn the tide and sway enough undecided voters. "I can't wait to tell my grandchildren 'yes, we were there. We saved this country for you. We voted for Donald Trump,'" she added. Trump also made a campaign stop in Warren where he spoke at Macomb Community College. His son, Donald Trump, Jr. is expected to visit Michigan State's campus on Wednesday according to a post on the Student Republican Group's Facebook page.